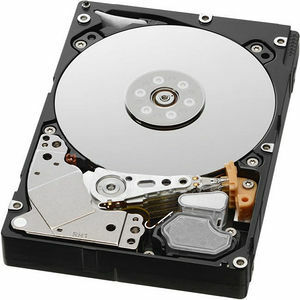 HGST delivers best-in-class capacity and performance in one small form factor hard drive. The Ultrastar® C10K1800 is a 10K RPM enterprise-class HDD that stores up to 1.8TB of data, 50% more capacity than prior generations, plus delivers best-in-class active and idle power efficiency, enabling next generation data centers to keep pace with digital data growth and improve space and power efficiencies. Data center architects can also leverage best-in-class performance on the C10K1800, achieving up to 2.5X better random write performance and 23% faster sequential performance over prior generation 2.5-inch SFF 10K RPM HDDs for demanding 24x7 enterprise workloads. Ultrastar C10K1800 delivers unmatched performance thanks to several HGST technology innovations including media cache architecture, the industry's fastest 12Gb/s Serial- Attached SCSI (SAS) interface and advanced format options. HGST's media cache architecture is a disk-based caching technology, which provides a large non-volatile cache on the media resulting in improved reliability and data integrity during unexpected power loss, as well as a significant improvement in write performance even at high workloads when compared to solutions with limited NAND or flash-based NVC. The C10K1800 is the industry's first 10K RPM drive to leverage an industry-leading 12Gb/s SAS interface, enabling very high transfer rates between host and drive. Advanced format models enable the industry's highest 10K RPM capacity at 1.8TB with 4K native and 512 emulation to support new systems, and also offers 512 native format models to support legacy systems. The Ultrastar C10K1800 offers the broadest range of encryption and security options available on SAS HDDs from HGST, including Trusted Computing Group (TCG) enterprise SSC-compliant Self-Encrypting Drives (SED) which provide data protection without any performance loss, and TCG with FIPS (Federal Information Processing Standard) 140-2 certification, which adds and tamper evidence protection for the most stringent regulatory data security compliance requirements. Instant Secure Erase (ISE) models enable fast, cost-effective and secure drive repurposing and retirement. C10K1800 extends the company's long-standing tradition of reliability leadership with a 2M hours MTBF rating and a 5-year limited warranty.